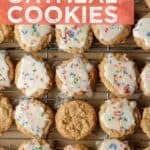 My all-time favorite oatmeal cookie recipe! 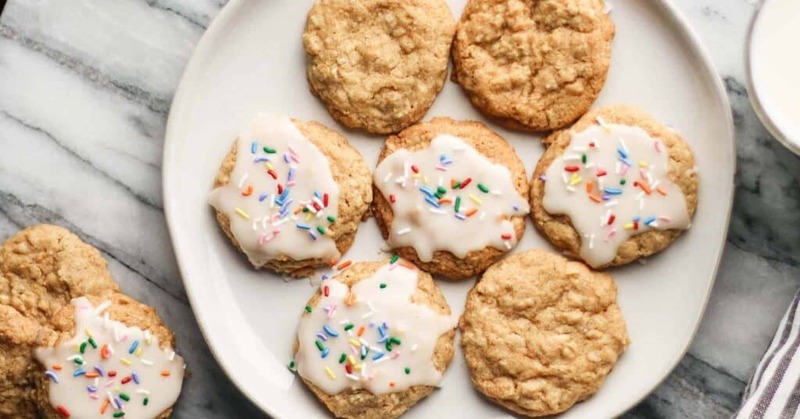 These Gluten-free Oatmeal cookies are the perfect balance of chewy and crisp! 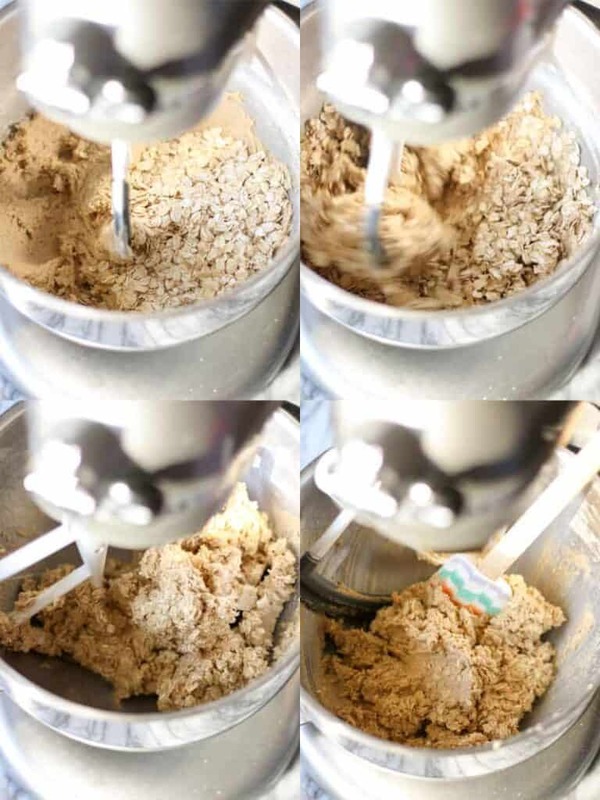 I’ve had this oatmeal cookie recipe for years and years. 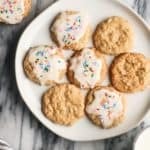 It is the best oatmeal cookie recipe. So when converting this recipe into gluten-free oatmeal cookies, I knew for them to pass in my book, they had to be just like the original. Slightly chewy on the inside and crisp on the edges. I made them a couple of times and they were good, but too crispy. The cookies were not quite like the cookie I was remembering. After a few tweaks, here they are… my favorite oatmeal cookie: new, improved, and gluten-free! Also, my BLD (breakfast, lunch, & dinner) for the past couple of days. Why did I think I’d be able to freeze half of these for Christmas? Let me tell ya… they ain’t making it to Christmas. 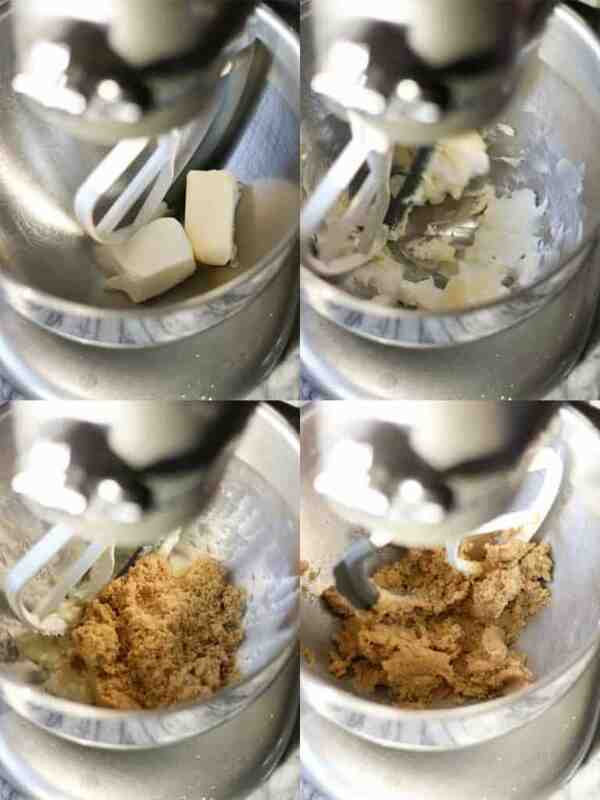 Cream together the butter, shortening, and brown sugar. Using a stand mixer or hand mixer is a good idea if you have it. Doing this all by hand is possible, but you’ll get a good workout! Then add in the egg and vanilla. Give it a good mix. Add in the oats, I used Bob’s Red Mill Gluten-free Rolled Oats (affiliate link). Let the dough mix until well combined. 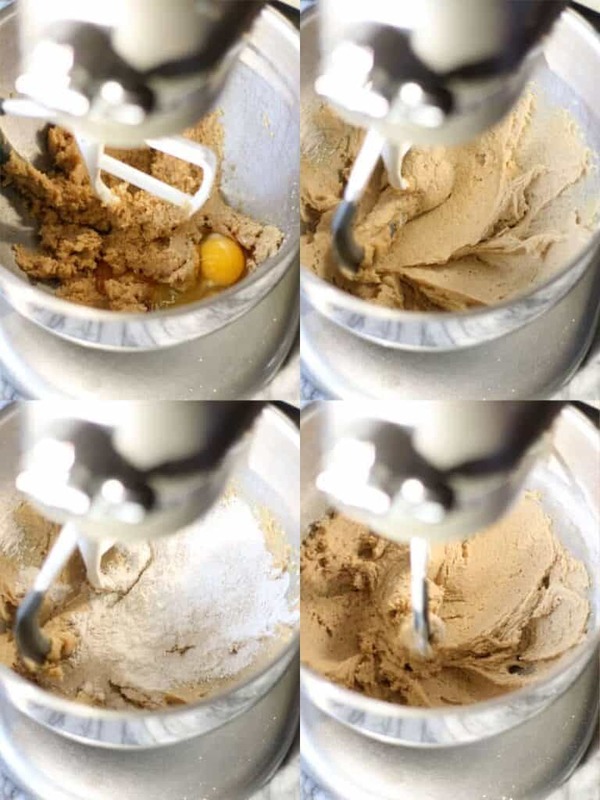 The dough gets pretty thick so make sure your mixer can handle this. If not, stir the oats in by hand. Want to know the best part about this dough?! It doesn’t need to be chilled! You can bake straight away or chill it if you want to! Both work equally great! 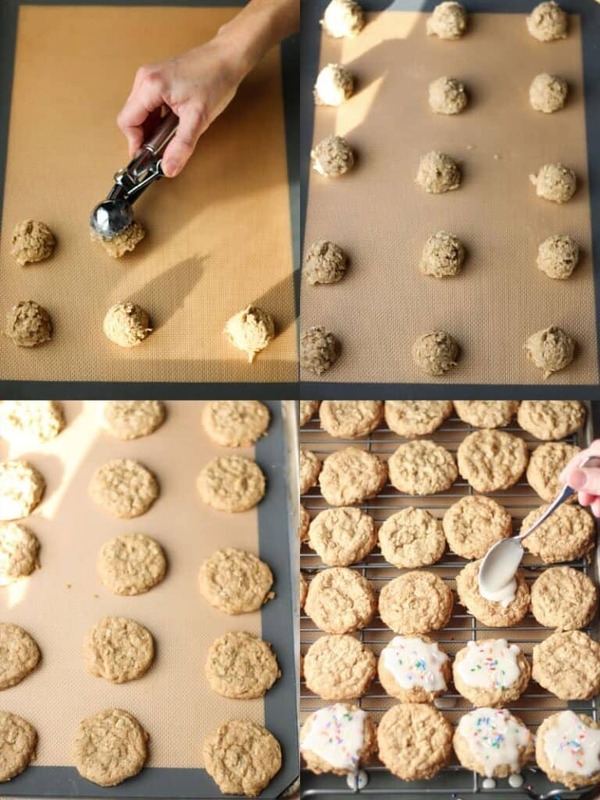 Just use a cookie scoop to drop the dough onto your cookie sheets. Pro-tip: This actually works with a lot of my gluten-free cookies. Allow the cookies to cool on the baking sheets for 3-5 minutes or so before moving to a wire rack. Gluten-free cookies tend to be more fragile than regular cookies and even more fragile when hot! If you allow them to cool and set a bit before trying to move them it helps immensely and prevents them from crumbling apart! Now don’t worry, this is not a crumbly cookie! This trick just seems to help when the cookies are fresh from the oven. These cookies are seriously awesome… even just plain! I’ve made them so many times and just eaten them that way! Although, if you want to take them to the next level, you know where I’m going here, they need a little icing! It’s a super quick and simple icing made with only powdered sugar, vanilla, and milk! Spoon the icing right over the tops of the cookies and then add a few sprinkles. Sprinkles make everything better! 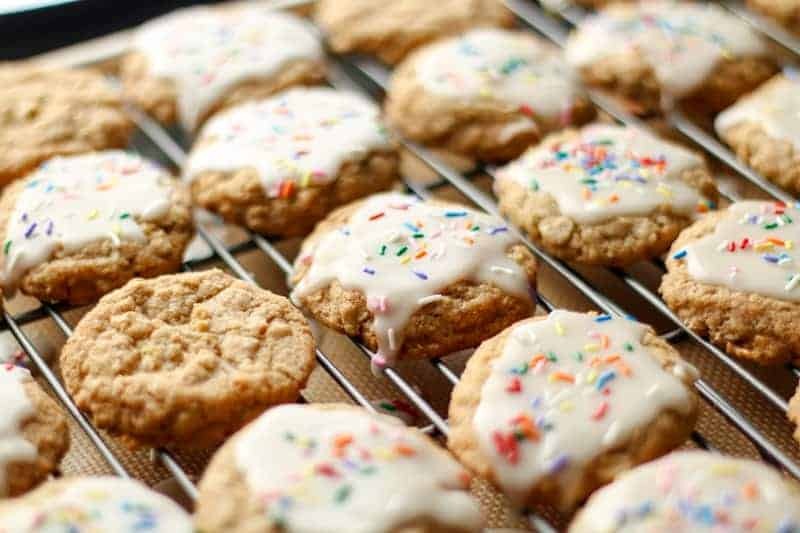 Let the icing set before stacking or storing these cookies. Once set, store the cookies in an airtight container. Also, they can be frozen! Another great variation for these cookies: add 1 cup to 1 1/2 cups of mix-ins like raisins or chocolate chips! 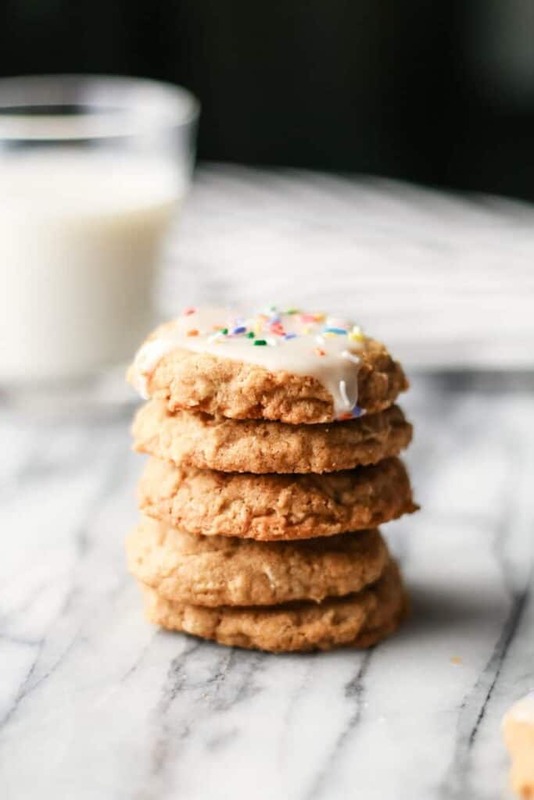 These old fashioned oatmeal cookies are so stinking good… add the icing to take them over the top! Preheat oven to 350°F. Use non-stick baking sheets or line sheets with parchment or silicone mats. Whisk together the flour, baking soda, baking powder, cinnamon, and salt. Set aside. Cream together the shortening, butter, and sugar. Next add in the dry ingredients and mix. Lastly, add in the oats and mix until well combined. Drop by rounded tablespoons onto the cookie sheets. Bake at 350°F for 10-12 minutes. Remove from oven and allow the cookies to set on baking sheets for a couple of minutes before removing to wire racks to cool. Combine the powdered sugar and vanilla. Add milk 1 tablespoon at a time, mixing well after each addition. Add milk until a thin, spreadable consistency is reached. Spoon 1 tablespoon of icing onto cooled cookies. Add sprinkles while icing is still wet, if desired. If you need more gluten-free cookie recipes, be sure to check out my Gluten-free Peanut Butter Blossoms and my Gluten-free Sugar Cookies! Just like Grandma Sparks’ only gluten-free. ???? Love your pictures too. Thank you! Maybe even better than Grandma Sparks’! ??????? ?